Tour de France winner Greg Lemond once said, "It doesn't get any easier, you just go faster." The same might be said for for the transition from product-market fit to the growth stage of a SaaS company. 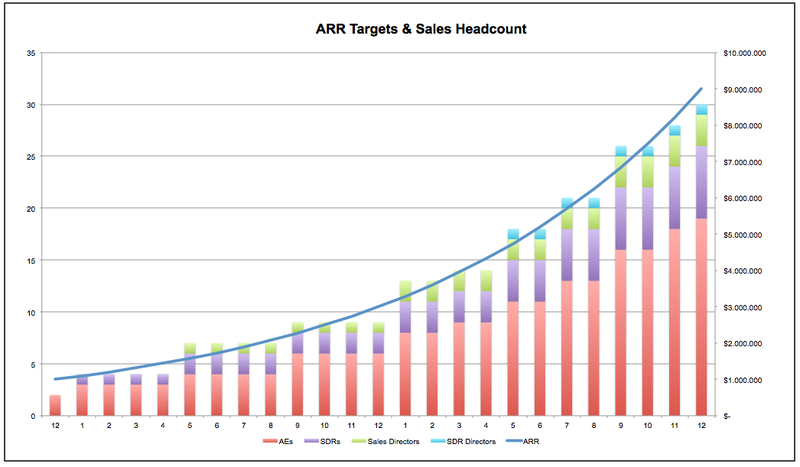 Once you hit $2 million in ARR, you want to want to get to $10 million in ARR in six quarters or fewer. To do this, you need to achieve about 15 percent month-over-month MRR growth! If you're thinking about quitting your startup to train for the Tour de France right now because that sounds more achievable, wait! This is a daunting challenge, but in today's post we're going to look at the four core tenets of a marketing plan (goal setting, tactics, resources and evaluation) that can help you achieve these goals. For growth to be lasting, it must be backed by clear goals and an operational framework that allows you to measure exactly what's working and what isn't. When it comes to a marketing plan, this takes two distinct pieces: The first is aligning your marketing and sales teams behind shared goals. The second is giving them the resources that they need to be successful. If you haven't done so yet, it's time to establish a revenue or lead-commitment based on your funnel metrics and revenue-growth goals. Then lock these goals in with a service-level agreement between your marketing and sales teams. To do this, work backward from the gross revenue amount that marketing is responsible for generating (generally around 40 percent). From here, clearly define how many marketing-qualified leads must be delivered to the sales team in a given month along with what percentage of those will become sales-qualified, then opportunities, then customers. These metrics will allow you to determine how many account executives will be needed for the sales team when factoring monthly quotas and quota-attainment percentages. It will also help you determine how many visitors and leads the marketing team needs to generate to hit its goals by working backwards from these metrics. 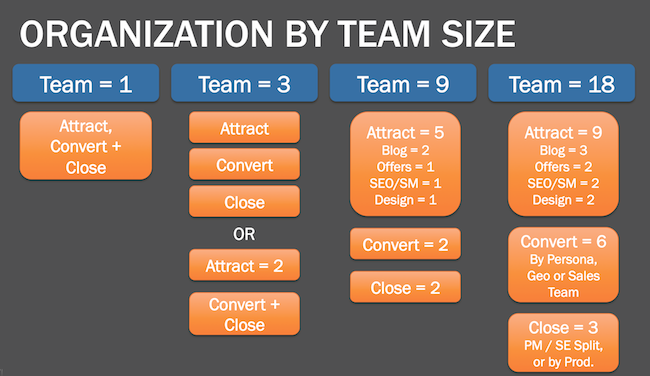 HubSpot data clearly indicates that by going through this process, the odds of your team meeting these goals goes up dramatically. There are many different fields of thought when it comes to setting a budget. Tomasz Tunguz has noted that SaaS companies invest between 80 and 120 percent of their revenue in sales and marketing, while Jason Lemkin has discussed using 40 percent of your revenue-growth delta as a marketing spend. 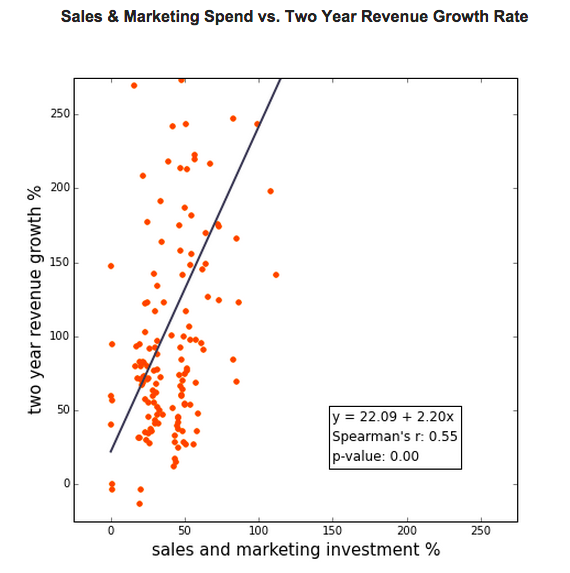 To confirm this, an analysis conducted by SaaScribe of public SaaS companies showed that when comparing sales and marketing spending to two-year revenue growth rates, each dollar spent on marketing and sales generated $2.20 over that time period—a lasting, positive investment. Whatever model you choose, it's important to ensure that you're setting aside the appropriate resources to hit your goals. Even the best marketers in the business may not be able to get you to where you need to go without the appropriate resources. With product/market fit reached, you're likely just coming out of a period where you've spent an extensive amount of time gaining a deep understanding of your audience. If you haven't yet, and before you do anything else, make sure you document this information into buyer personas. This understanding will be the foundation of every marketing decision you make moving forward. And even if you have already done this, it never hurts to revisit them to ensure they're still accurate. 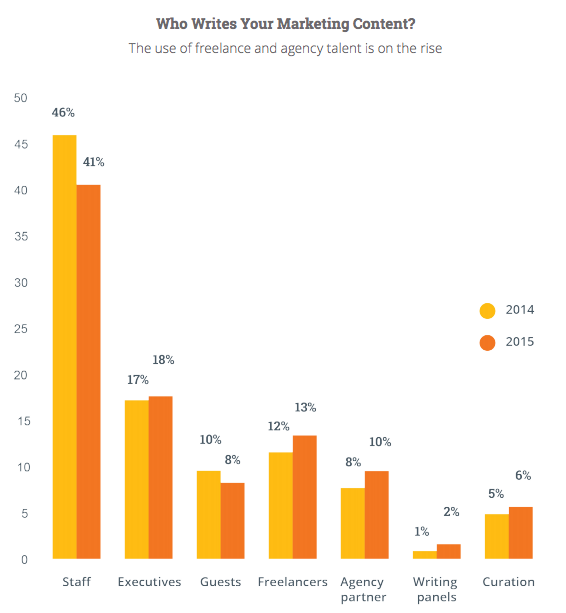 In fact, doing this was one of the key factors that enabled us to double our blog leads. In 2015, inbound marketing is table stakes for SaaS, and scaling these efforts from how they appeared in your startup marketing initiatives to this high-growth phase will be key for long-term success. 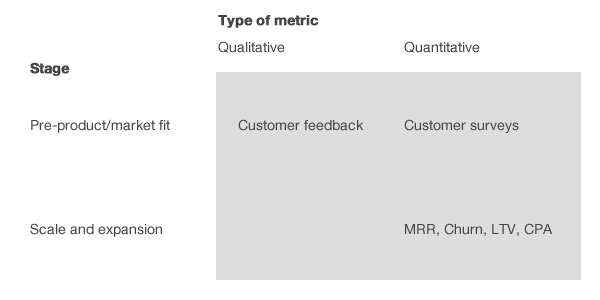 The stories of SaaS companies growing their business using this methodology are multiplying by the day. They include HubSpot's prodigious blog, UnBounce's reflections of content success, Wistia's learning library and SEOMoz's vibrant SEO community, to name a few. Of course, for content to be successful, the strategy must be organized and unique to break through the ever-increasing cacophony of other companies investing in content production. So in your marketing plan, look at some different examples of success to get the creative juices flowing. Then define the key topics and content types that will need to be invested in, and how they relate to your ongoing initiatives. With revenue growing and an expanding user base, it's likely that your marketing budget has increased as well. Using this budget to 1) amplify your content with paid advertising, and 2) capture prospects who may not have converted on their first website visit with retargeting are great ways to grow your user base. Numerous SaaS companies have seen success with various types of paid advertising. While the channels that make the most sense for your business will need to be tested, when done correctly it's possible to lower cost-per-lead and -acquisition. For example, NewsCred was able to create leads that were 50 percent more valuable using LinkedIn than those acquired through AdWords. Another example of a great retargeting success story comes from Bizible, which was able to quadruple their retargeting return by segmenting its audience by funnel stage. This strategy and investment allowed it to drive leads with content downloads at the top and middle of the funnel and a demo request at the bottom, improving CTR by 433 percent and a drop in CPC of nearly -81%. 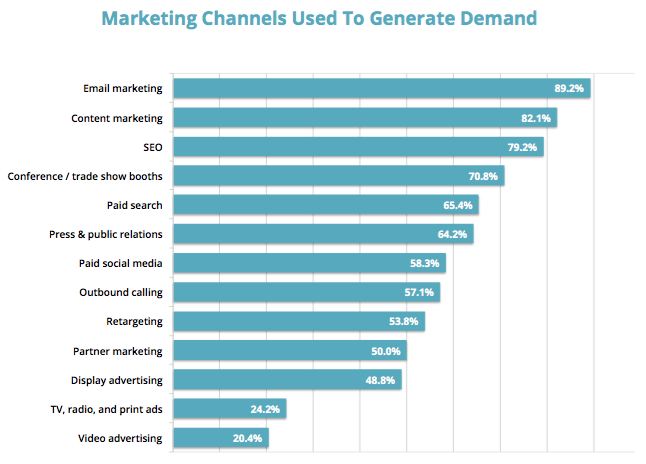 The inaugural State of Pipeline Marketing Report has shown that email marketing is the top channel used by B2B marketers to generate demand. 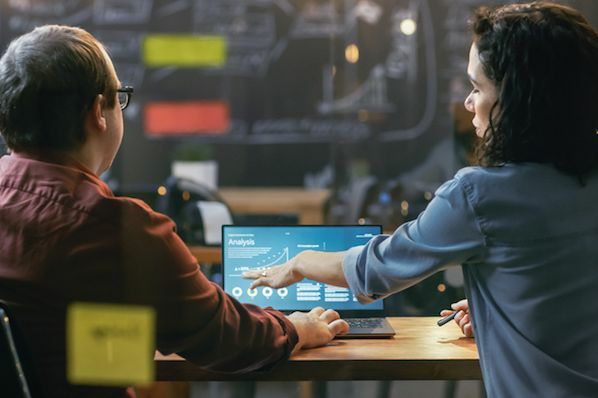 With this in mind, and recognizing that as your lead velocity and team scales, the importance of marketing automation will grow. This means that effective lead nurturing needs to be made a priority both at the top of the funnel and in your free trial or post-demo stage. The best way to approach this is by creating nurture streams and experiences for each of your buyer personas to ensure that they are receiving the most relevant information. It also gives you the opportunity to resell your value proposition and offer them compelling information to re-engage. In some instances these campaigns can even run for a full year, with an email cadence at 1, 4, 7, 14, 21, 30, and 45 days, and then every two weeks after that. With the goals, budget and tactical strategy in place it's time to assess the resources that will be needed to hit your growth goals, including which apps for startups you will use. Of course, there are clear benefits of a lower fixed-cost and management expense that comes from outsourcing, especially in a high-growth period where resources can be stretched. For those looking for more information on this decision, I highly recommend checking out this post from Neil Patel. If the team is going to be built in-house, plan to specialize your team by funnel stage to help prioritize where your biggest challenges are and who needs to be hired (and when). In doing so, prioritize top of the funnel first as investments in these leads make everything else possible downstream. If that model doesn't feel quite right for your company, you can look at some proven alternatives here. We're going outside the marketing plan now, but I'd be remiss not to at least mention that if a VP of sales has not been hired yet, this will be one of the most crucial hires over the coming year. Christoph Janz has written about this extensively and has shown that as you move from $1.5 million with an eye towards $10 million in ARR, it's going to take an excellent VP of sales to get you there. Of course, any good marketing plan will include how it will be measured. 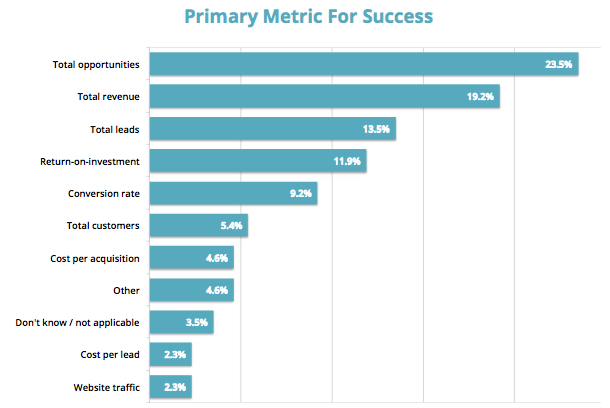 Here are the key metrics that you should look to when gauging the marketing success of your SaaS. 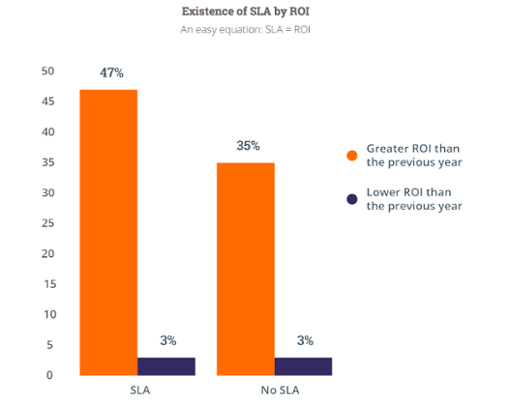 MQL velocity has been called "the most important metric in SaaS." This is because though sales and pipeline forecasts are useful, they are lagging indicators hinging on both correct opportunity probability assignments and close dates. 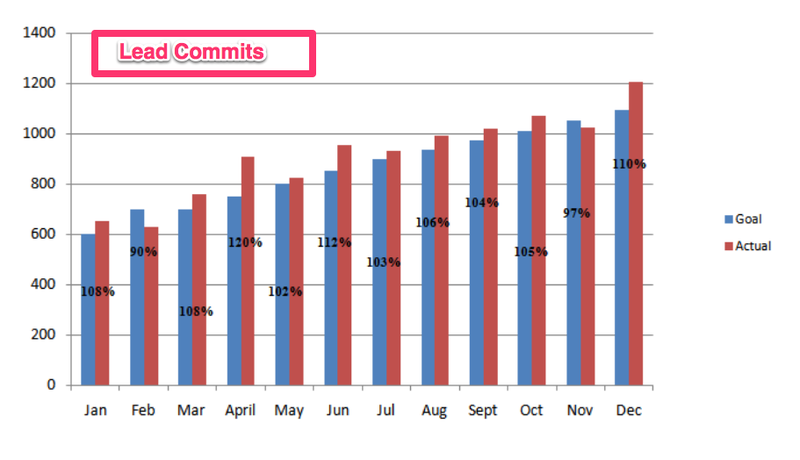 However, by looking at MQL velocity compared to lead commits, you can see forward-looking insights beyond a traditional pipeline report. The State of Pipeline Marketing report shows that "opportunities sourced" is the primary success metric for B2B marketers. This is because these down-funnel metrics provide a more accurate look into the true contribution of the marketing team than vanity or top-of-funnel metrics alone. 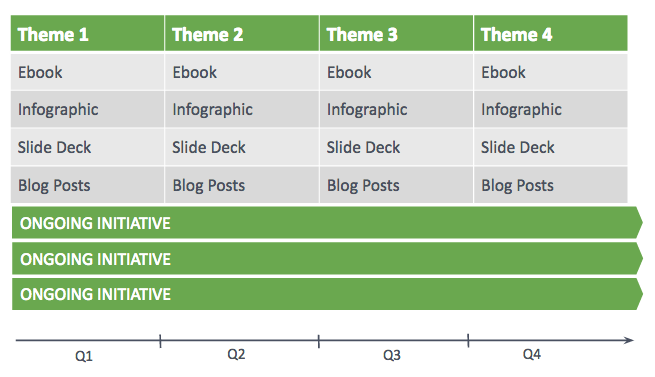 There are hundreds of posts out there discussing each of these metrics in detail, but David Skok's blog will give you everything you need to know. And if you're wondering how your business compares to others in the space, check out this SaaS Grader. Creating a comprehensive marketing plan can be a daunting task, but having a clear strategy at the outset will set you up for success. To help SaaS business leaders on this path, we just released our Definitive Guide to SaaS Marketing. In the guide, we will take you through a number of comprehensive and actionable ways you can create a highly effective marketing strategy to grow your business. In addition, if you're looking for a partner to help you align a plan and strategy with your company's growth goals, don't hesitate to give us a shout.